The Oceanus 20700 is a sleek kit comprised of the Oceanus Mod and a Scion Sub Ohm Tank. The Oceanus can go up to 110 Watts and is powered by the uniquely sized 20700 Battery. It has different modes and is capable of wattage, voltage, and bypass depending on how the user prefers to vape. 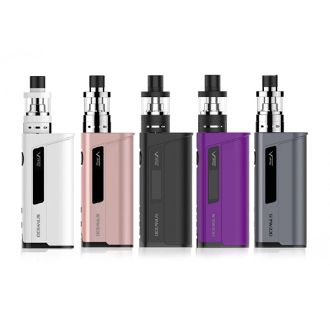 Just like other Innokin products the vape while you charge pass thru function is a feature for this kit. The Scion Sub Ohm Tank has a great balance between flavor and vapor production and since it's a high wattage tank it pairs really well with high wattage mods. It holds 3.5mls of e liquid and can be conveniently filled through the top. The tank has dual airflow slots which can be twisted left and right at the users command to control the amount of air let in with each hit.